Hello and welcome to Sevenfold Border Collies website! I live in Łódź, Poland, along with my four loving and fun Border Collies: Finn, Fizz, Jewel and Draco, and my beautiful Collie, the pack leader Amiga. Amiga was my first serious step into the canine world, and she opened up a whole new way of life for me that I didn’t even know existed. It began with my introduction to the amazing world of canine sports - Frisbee to be exact. From there, I found an immense love for the Border Collie breed. Their incredible athleticism, loyalty, intelligence, fun-loving spirit and excitable personality took my breath. Soon after, thanks to the wonderful world of canine sports, I discovered a love of photography and naturally combined my two passions into one fantastic adventure (www.k9action.eu). Along the way, I have had the pleasure of becoming the human caretaker to a wonderful pack of canines, mostly thanks to the invaluable help and support of my friends. This consequently brought me into the world of breeding, which I take very seriously. 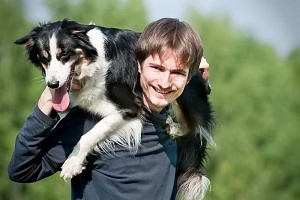 With Border Collies, as with any breed, there are specific, stringent rules to follow in order have the healthiest, happiest and of course most versatile litter of pups possible. There is nothing quite as awe-inspiring as a newly born pup opening its eyes for the first time or learning to take its first steps, as well as admiration of a maturing dog discovering their own passion among the variety of activities Border Collies are meant for. I truly enjoy bringing a family together with a new puppy, and I take pride in witnessing the happiness that ensues at the beginning of their adventure and later on. So, I along with my pack, welcome you to our website. We hope that you enjoy your visit. Most of all, we hope that you leave with a smile.